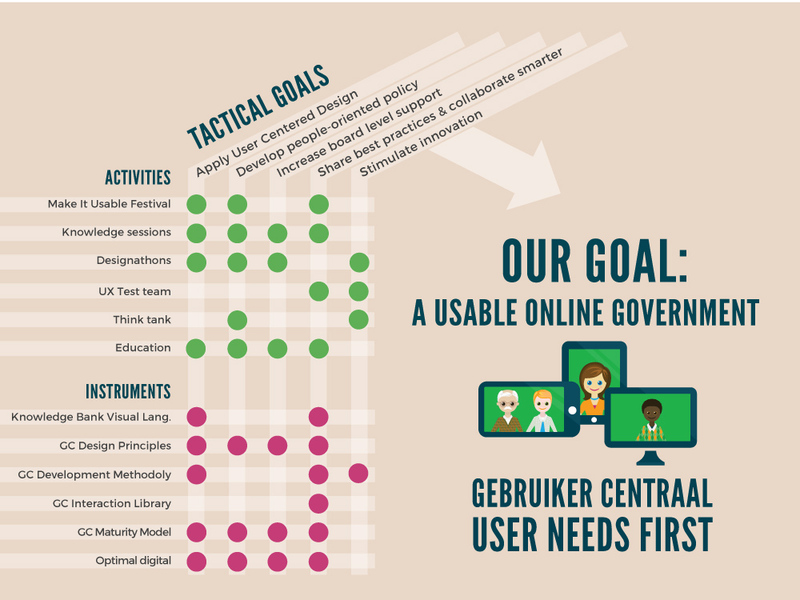 Gebruiker Centraal (loosely translated: ‘User Needs First’) is a community of professionals that are working on Dutch eGovernance services. The community strives for a more user friendly online government. The core of the community is formed by an action team of 21 volunteers, all working in public administrations (ranging from ministries to municipalities). A team of 6 ambassadors helps us promote the user’s perspective at board level. To give our international colleagues an idea of what we are doing, we have translated an article about our strategy. The article below was previously published in January 2018 on iBestuur, a Dutch website and magazine about IT in Dutch government. The hyperlinks in this article link to Google-translated versions of the original websites. User Needs first. Sure. #ButHow? “Our online service puts the needs of citizens first”. “We work from an outside-in perspective”. These statements are all too often heard within Dutch government. Statements no one could disagree with, really. At the same time this raises questions. What exactly are we talking about? And how can we develop a user-centered perspective? After all, we all want world peace; war only breaks out the moment we start discussing about how to achieve it. In this article I will describe how we, members of the government-wide knowledge community of Gebruiker Centraal (loosely translated: User Needs First), contribute towards a user-friendly online government, that focuses on the needs of citizens and entrepreneurs. This provides an insight into our strategy and hopefully leads to a healthy discussion (without any warmongering, I should hope). Before we discuss our strategy, I would like to take a moment to address the various motivations to emphasize the perspective of the citizen / entrepreneur / user / customer / client / etc. I will focus primarily on the digital channel, while acknowledging the continuing importance of other channels. Firstly, several studies have recently been published about this subject. For example, the National Ombudsman states: “The government is there for the citizen. And not the other way around. The government must place the user at the center of its services and communication.” Fortunately, this view also starts to receive more political attention. As professionals working for public institutions, we need act upon these recommendations. Secondly, there is the financial perspective. If you want to save costs by digitizing services, you can only do that if you organize them based on the user’s perspective, according to this research by GBBO for the Dutch Ministry of the Interior. At the other side of the Channel the claim is even bolder: it is estimated that the British government saved three billion pounds by putting the user at the heart of the development of online services (if only ten percent of that claim is true, it’s already well worth it). Finally, there’s this thing called professional pride. Most of us who work on developing digital services for government just want to do a good job. Developing services in a user-centered way is simply part of that. Whatever your motivation may be, there is no doubt it is important to develop quality government services. I will not claim here that user-friendly services can restore confidence in democracy and politics, but the opposite is certainly true. We simply cannot afford to stay behind developments outside government. Citizens will no longer accept jumping through bureaucratic governmental hoops in times when you can open a bank account within a minute via your smartphone. Nor should they. Right. So far we all still agree. World peace, I beg your pardon, a user-friendly government is something to aspire to. But now what? What are we going to do differently from now on? Apply User Centered Design. By sharing knowledge, providing tools and offering support, we make it easier for professionals and organizations to start working differently. The Gebruiker Centraal design principles are leading in this. Develop people-oriented policy. When making new policy, the needs and capabilities of citizens are examined and the assumptions about these are validated at an early stage. This way the policy and its implementation actually achieve the intended effect. Increase board level support. The Design Principles from the Gebruiker Centraal Manifesto will be adopted more widely and are included in position papers for digital government. Our ambassadors help us out with increasing top-down support. Share best practices & collaborate smarter. We still reinvent the wheel too often. By sharing interaction patterns , designs and code, professionals can get to work faster and the online government becomes more easily recognizable for citizens. Stimulate innovation. Technological change is accelerating. We help to keep the focus on the needs, capabilities and behaviours of users when adopting these innovations. With major IT innovations and developments in government, it is all too easy to put the interests of the stakeholders before the interests of the end users (browse through the business cases on the Dutch ICTdashboard if you don’t believe me. I rest my case). As befits a community, we focus on areas that best serve the needs and interests of our members. However, we always keep a keen eye on whether our activities contribute to the five tactical goals mentioned above. As the Gebruiker Centraal community started in 2014, we mainly focused on raising awareness of the field of User Centered Design and on sharing best practises. That is why we mainly organized meetings (and we will continue to do so, but with more advanced subjects). We now realize that the importance of putting the user’s needs first is less and less controversial. Meanwhile the community has become bigger, with at its core a voluntary action team that has grown to seventeen people. There is a lot of knowledge within the community. Recently, more and more of this knowledge has been incorporated into tools that professionals can use in their daily work. For example, the benchmark of the Gebruiker Centraal Maturity Model and the Knowledge Base of Visual Language. In the coming years we will continue to develop such instruments. From 2018 on we will go one step further. We now offer partner programs for organizations and large projects, using the knowledge of the community and the instruments we developed to help organizations improve the usability of their digital services. To help out with challenges such as: how do we safeguard the user’s perspective starting from the exploratory phase in our projects? How do we convince employees and management of the importance of user-friendliness? The fresh outside perspective from people who know the inner workings of government well, helps organizations to take the next steps. For Gebruiker Centraal, the partner programs are a means to exert a more direct influence on developments within the digital government. At the same time, this new approach entails a risk: we could lose our independent critical role. Or worse: we be used as an excuse (“Sure, but the Gebruiker Centraal people were involved, so now our service is user-friendly”). Something for us to keep a keen eye on. We believe that the above approach contributes to abstract ambitions such as “working from the outside in” and “putting xyz’s needs first”. We are curious about your ideas to make the government more user-friendly. Drop us a line!